You can booking directly on this website by using the "check availability box" to the left. 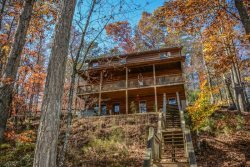 What are the benefits of a vacation cabin rental? Our vacation cabins are stocked in such a way that you always feel like you are coming "home" to your "vacation cabin" rather than returning to a small hotel room. Our cabins have full kitchens, with some cabins having game rooms, hot tubs and BBQ grills. You will be able to enjoy a full service cabin while you are on vacation rather than a small, cramped hotel room. You can begin the booking process by the using the criteria selection fields/buttons below the pictures on the main page or to the left of the cabin pictures. Once you select a cabin, you will be prompted to take the next steps to book your next vacation! Where can I find directions to the cabin? As you can imagine, safety is paramount when it comes to protecting the cabin owner's investment. Therefore addresses and directions are not published on the website for the rental cabins. Instead, once your reservation is complete, you will receive an emailed copy of the Check In/Out Instructions along with detailed driving directions. A Note Of Caution: do not rely on GPS in the mountains as sometimes cell service is not very good and GPS can fail. How do I pick up my key or receive the electronic doorlock entry codes? Once you booking is complete, you will receive an email that contains the Lockbox box codes and/or the electronic code for the automated doorlock. When using electronic codes, please be aware that the codes become active for entry at 4pm and will deactivate at 11am the day of your departure. You are able to purchase an early check in or late check out should you need it. How are the hot tubs cleaned? Hot tubs are drained after every use. They are wiped down with disinfectant, the filters are changed and if needed, replaced. Once complete, they are filled with new water and chemicals are added. The water will be set to 90 degrees when you arrive. Most of the cabins in the mountains are on well water, so from time to time the newly filled tubs may be cloudy until the chemicals take effect and the water can cycle through the filter. Check in time is 4pm unless you have made alternate arrangements. Door codes will not work until 4pm the day of your arrival. Check out time is 11am unless you have made alternate arrangements. Door code will stop working at 11am the day of your departure.